The hilarious sequel to the #1 phenomenon Politically Correct Bedtime Stories. "If we can cleanse these stories and put an end to the lies our children are spoon-fed while being spoon-fed...the world may finally become a decent place for persunkind and other, equally important species." 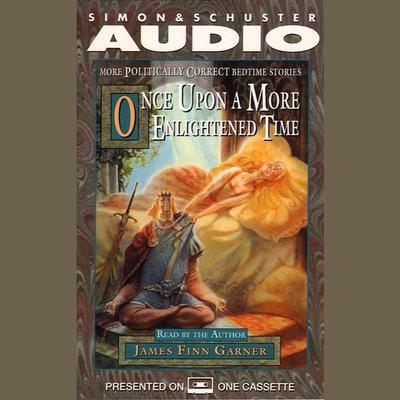 -- James Finn Garner Spurred by the overwhelming success of the million-copy bestseller, Politically Correct Bedtime Stories, James Finn Garner continues his quest to liberate "classic" fairy tales from their archaic, sexist, ageist, classist, lookist and environmentally unsound prejudices. In Once Upon a More Enlightened Time, Garner tackles many demeaning, culturally biased viewpoints through his retelling of such well-known tales as "The Princess and the Pea" and "The Tortoise and the Hare." He has striven to fashion these bedtime stories into literature that is totally free from bias and purged from the influences of a flawed cultural past in hopes of freeing our social consciousness from these blights. If he succeeds, no longer will tortoises, hares, talking frogs and other citizens of nature bear the burden of our insecurities. No longer will mer-people suffer because of their unique evolutionary niche. And no longer will capable young womyn sleep their lives away waiting for princes to come rescue them. The hilarious sequel to the #1 phenomenon Politically Correct Bedtime Stories. Spurred by the overwhelming success of the million-copy bestseller, Politically Correct Bedtime Stories, James Finn Garner continues his quest to liberate "classic" fairy tales from their archaic, sexist, ageist, classist, lookist and environmentally unsound prejudices. In Once Upon a More Enlightened Time, Garner tackles many demeaning, culturally biased viewpoints through his retelling of such well-known tales as "The Princess and the Pea" and "The Tortoise and the Hare." He has striven to fashion these bedtime stories into literature that is totally free from bias and purged from the influences of a flawed cultural past in hopes of freeing our social consciousness from these blights. If he succeeds, no longer will tortoises, hares, talking frogs and other citizens of nature bear the burden of our insecurities. No longer will mer-people suffer because of their unique evolutionary niche. And no longer will capable young womyn sleep their lives away waiting for princes to come rescue them.